Arthritis in the shoulder is typically one of two locations. 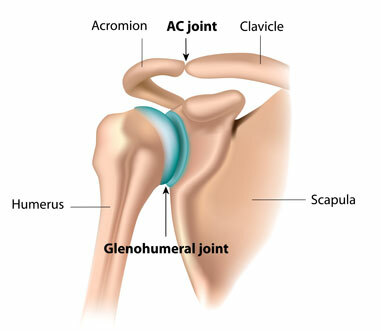 The ball and socket joint (glenohumeral joint or GH) or more frequent the AC joint, where the collarbone meets the shoulder blade. There are a lot of causes of arthritis in the shoulder. As in most joints, the most common being wear and tear (overuse), trauma, and often age related factors. The resulting pain and inflammation can quickly lead to loss of motion and strength in the joint. Pain from the GH joint is typically felt in the back of the shoulder while AC joint arthritis is felt on top of the shoulder. Both types typically present with similar physical restrictions like difficulty reaching the top shelf of a cabinet, trouble putting on a shirt/blouse or coat, inability to fasten a bra strap behind your back, or pain when turning a steering wheel. From a physical therapy standpoint, the main difference in treatment between the two, is identifying the correct structures involved (causing the pain) and directing our treatment to that area. Knowing the primary structure causing the pain and dysfunction allows your PT to isolate those tissues with the appropriate treatments to facilitate quicker pain relief and better overall outcomes. So just what are these treatments that you speak of? Manual Therapy is an extremely important element in the treatment of shoulder arthritis. The manual therapy targets the stiffness and range of motion deficits. Your therapist will gently move and mobilize your muscles and joints to improve their motion, flexibility, and strength. These techniques can target areas that are difficult to treat with the typical pulleys, stretching and home exercises on your own. As stated on our general arthritis page, the muscles around an arthritic joint are susceptible to becoming weak thus not supporting healthy function due to the fact that you limit your activity when your joint/shoulder is flared up. 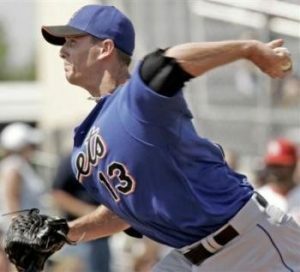 This is a particularly significant problem in the shoulder where the amazing amount of motion available depends, to a great extent, on the ability of the muscles to stabilize the joint. This places a greater burden on the muscles for stability and function. By instructing you in exactly the exercises your shoulder needs we can greatly increase the long term benefits of your therapy.